If you’ve just moved to the Ann Arbor, MI area and want to participate in some of the best cross-country skiing, Michigan is a beautiful haven to enjoy this winter sport. Enjoy the quiet, snow-covered landscapes throughout the area on trails that provide pristine scenery and the opportunity to appreciate nature. Cross-country skiing in Michigan is a delight for not only experienced skiers but beginners as well. 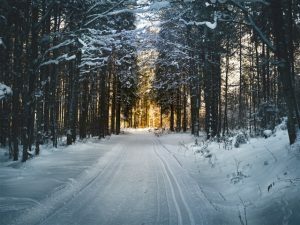 If you’re newly relocating to Ann Arbor, MI and are looking for some idyllic cross-country skiing spots, here are a few trails to check out. Located in Milford, MI, Kensington Metropark provides more than 12 miles of groomed trails surrounded by frozen ponds, snow-glazed fields, and beautiful woodlands. This destination offers beginner and intermediate level trails through the park and golf course. There is also a nature study area, nature trails, snowboarding, sledding, tobogganing, and ice fishing. This pristine park situated in Ypsilanti, MI offers three miles of maintained cross-country ski trails including a level, shorter trail for beginners and a longer trail with varied terrain for the more experienced. There is also a half-mile, torch-lit ski trail, which is picturesque and ideal for early sunsets. Enjoy six miles of groomed trails at Hudson Mills Metropark in Dexter, MI. The course trails are groomed for classical skiing and have varied terrain to accommodate all skill levels. Stop off and enjoy the view from one of two rustic bridges overlooking the Huron River. An activity center features a heated lounge, food service, and public restrooms. One of only a few parks in southeast Michigan that offers both skate-style as well as classically groomed cross-country ski trails, Huron Meadows Metropark is located in Brighton, MI. This park provides more than 15 miles of trails groomed for tracked, classic skiing on easy to moderate terrain, and more than 11 miles of trails groomed for skate-style skiing on moderate terrain with rolling hills. Not much mother-nature-made snow? No problem here! You can still enjoy some skiing on Buck’s Run, a 1.5-mile loop made from snow shot from snow guns. This trail is lit at night for added fun. Several trailheads also provide access to this expansive ski trail network. In Belleville, MI the flat terrain at Lower Huron Metropark allows you a blank palette to carve your own cross-country ski trail. Experience stunning views of the Huron River with spectacular wooded forest and glimpses of friendly wildlife along the way. The park also has two natural ponds used for skating. One is reserved for pond hockey while the other hosts family-friendly open skating. Michigan cross-country ski trails provide hours of outdoor excitement and fun throughout the winter. Ann Arbor, MI has many trails to enjoy, and we have covered just a sampling here. If you’re lucky enough to call Ann Arbor, MI your home you have your choice of many winter activities, including cross-country skiing. So, with the next snowfall put on some skis and get gliding! Enjoy the quiet beauty on the ski trails. Check out our blog for ideas about how to settle into your new home in Ann Arbor, MI. At Corrigan Moving Systems we want your move to be smooth and successful. "I wanted to let you know how awesome the guys were who moved me into my apartment. They were all very kind and made sure everything was in good order before they left."